That Blind Tech Show: Tim Apple Gets to the Core of Apples Upcoming Services and Launches Apple News Plus Subscriptions. An Apple Card? It’s titanium! You Know You Want It. I would go into detail in the show notes but why not just listen to the show and become the smartest new Apple News knower in your neck of the woods? Yes, we can give you that! Not much more, so take it. Oh, surely I jest, Yup, Jeff the Jester. Hmmm. Join Serina Gilbert our Voc Rehab Counselor from the Mountains, Allison mervis, a Voc Rehab Super from the Grape fields of California, Brian Fischler, an Assistive Technology Specialist, stuck somewhere in the Big Apple and myself, Jeff Thompson, Teacher, Woodworker and media Specialist from the Frozen Tundra of Minnesota. And a special little cameo from our man in trouble, Marlon Parieaho from Trinidad. 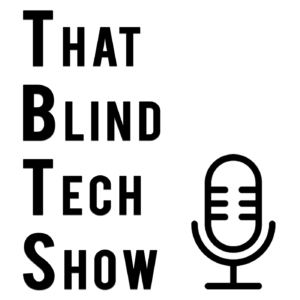 That Blind Tech Show is definitely a humorous take on the latest news and happenings around the World of Blindness. We try to have fun with each other and bring a smile to your day. Humor is good for the soul and if we can’t laugh at ourselves, then hey, we would miss out on having a lot of fun. Don’t take us seriously all the time and yet, we do our best to bring you good news and information to help you through the obstacles and brick walls that seem to be holding us back or blocking our path. If you have any suggestions and/or feedback for us here on the show, be sure to let us have it. Smack between the eyes if need be. But, start with Brian, he started it anyways. If he can’t take it for the team, then I am in trouble. Ok, thanks for listening and see you next time on That Blind Tech Show!